Tired of tangled necklaces and missing earrings? 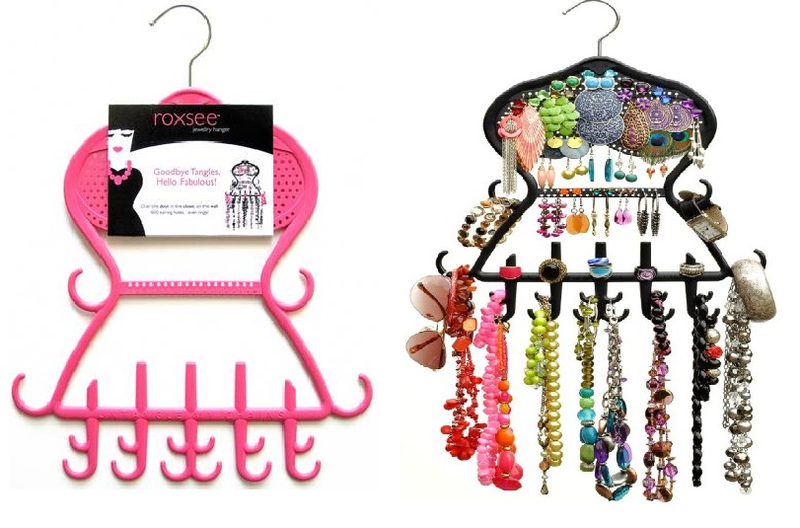 Say good bye to tangles and HELLO fabulous with the Roxsee Jewelry Hanger! With everything organized and out for view, you'll know what you have and what you want to wear in seconds. This hanging jewelry organizer has 400 earring holes, 16 sturdy hooks and 5 posts so you can store all your fashion jewelry in one place...even rings! Easily store 100 pieces or up to eight pounds of your favorite fashion accessories. The metal hanger rotates and can be hung in your closet, on an over-the-door hanger, or wall mount. Can also be used for scarves, belts, hair accessories and more! Proudly made in the USA from no break polypropylene, strong and sturdy with a soft exterior that will not react to metals! Size: 17" X 13.5" X 0.25"